Well, after 46 fantastic games of rugby we now have our finalists, the mighty All Blacks taking on the all-powerful Wallabies! 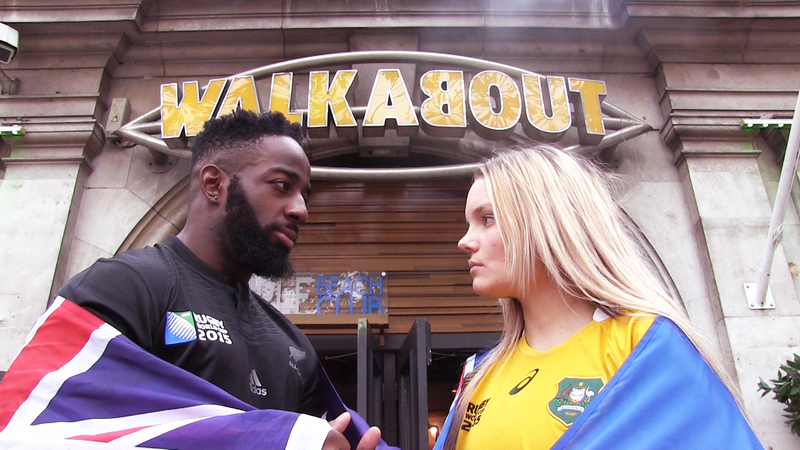 Walkabout have enjoyed many incredible games celebrated in an atmosphere that only a Rugby World Cup can generate. Fans from across the world have descended on Walkabout along with the home nations to cheer on their teams and create a party experience like no other! The final will be no different and Walkabout expects it to be one of the highlights of the sporting calendar. “The World Cup has been without doubt our biggest event of the year. Rugby fans have really made this event unique, culminating in our dream final, Australia going to battle against New Zealand. This Saturday we expect to be full of both Aussies and Kiwis for this fantastic occasion and hope it delivers a final we all hope it can be”. You can guarantee the best seats in the house by pre-booking an area for you and your mates – you’ll be so close to the action, it’ll feel like you’re in the stadium! There’s no better way to soak up that big match atmosphere. In association with Heineken, Walkabout are proud to be showing this exciting tournament live in HD, and will be going the extra mile to give the best viewing experience to every one of their customers.